Look, I said I’d write again soon, and here I am. I wanted to talk about the Ban List a little, and the evolution of it, and Yugioh. At least, to a point. Let’s look at some changes, shall we? Supreme King Dragon Starving Venom–also Banned. A long name but a powerful card. Too easy to bring out (also hindered by Astrograph being Banned) and some OTK capabilities. Ancient Fairy Dragon–also Banned, who knew we even used Synchros anymore, right? I’ve been reading the Forums, as well as other boards, and people said this card should be Banned. It was just a little too easy to abuse in too many Decks, yet didn’t do much on its own. So there we go. The Grass Looks Greener–This was a good Ban, in my opinion. This was one of those cards that can let you generate mass advantage to yourself, just by thinning your own Deck, and dumping into the Graveyard. The thing that makes this all the more unfair is, you likely all ready either overextended, so you’re coming back, or you’re actually skilled enough to hold off long enough to make this greatly work in your favor. Too random and luck based at the same time. Gem Knight Master Diamond–Surprises me, I feel like Gem Knights ARE a solid Archtype that always seem to hang around, but never quite seem to be cream of the crop. But only having 1 stops arguably their best card from being abused. Maybe more of a pre-emptive move. 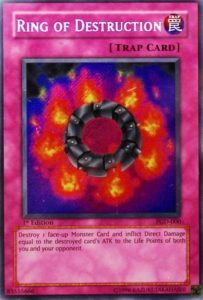 Ring of Destruction–the last card I’ll touch on, went from Limited to Semi-Limited after it’s terrible, soul crushing (balancing) errata. You’ll probably see this Unlimited next cycle, whenever that happens. Anyway, here’s the point. As far as evolution and changes go, both in the game of Yugioh, and to the Ban List, it’s pretty clear. Look at all the Extra Deck Monsters we see here (just from what I took to talk about) and this is good. It shows we have a lot of variety in our game when you don’t see generic cookie cutter cards being hit, but Deck specific cards. We see (like with Ring of Destruction) how an errata can completely ruin a card, you’d never see the original Ring at more than 1. (Not that erratas have to be a bad thing, though you might not know that, as it seems like each one just destroys how good a beautiful card once was). Remember, too, how cyclical the Ban List use to be? Now, we get them whenever they feel it’s necessary, no set time between lists. No guarantee of when anything is going to happen. But that’s exciting too, not knowing when the next change is coming. 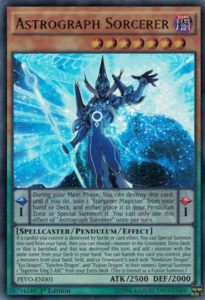 Yugioh has been around a long time, but the game, and not just in game play, but mechanics as well, is ever changing.